I prefer to not surround myself with too much stuff. I hesitate to put down roots and hold the belief that I can pack up and take off at a moment’s notice. A friend tells me I’m looking for something that I haven’t found. I’m more inclined to think I suffer from chronic commitment issues and spiritual claustrophobia. And so I clear my closet of clothes not worn for years. I purge the shelves of books rarely opened and cull the desk of knick-knacks whose sole purpose for existing is to catch dust. With the space around me cleared, so somehow is my heart. Yet what I’ve done is create a fleeting illusion of space that requires tender care. Only mindful vigilance will prevent a new collection of bits and bobs from building a jumbled barrier that distracts and blocks my path. It has been one hundred and eighty days since my last hefty donation to Goodwill. Pride in accomplishment allowed my guard to drop. The space around me has filled. As a consequence, so has my spirit. It’s time. Time to plunge into the mess. Time to choose. Time to let go. Again. The questions I’m asking are simple. What do I need for my life to have heart and meaning? How many layers do I have to strip away before I find Truth? I am beginning to realize that my constant craving to pare back the physical layers is not enough. Taking away the stuff around me – breaking down the barriers – isn’t enough. Maybe my friend is right. Maybe I am looking for something. 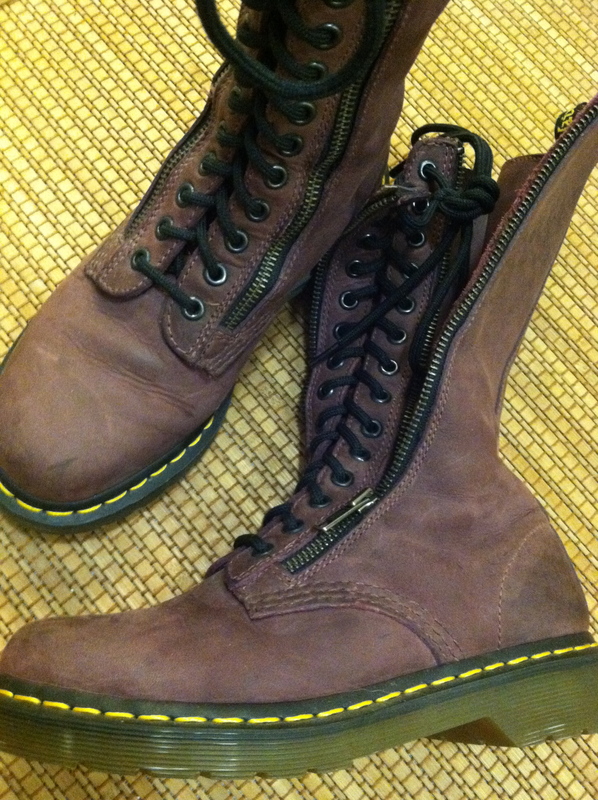 But I won’t find it in the space where my purple Doc Marten boots used to be. This entry was posted in meditation, philosophy, relationships and tagged Doc Marten, meditation, Religion and Spirituality, yoga. Bookmark the permalink.